Why are Traditional Leadership Development Programs Ineffective? Design your leadership training program without proven adult learning techniques and as much as 80% of your training investment is flushed down the drain. Design your program without consistent metrics and most will ultimately consider it a failure, even when significant progress is achieved. 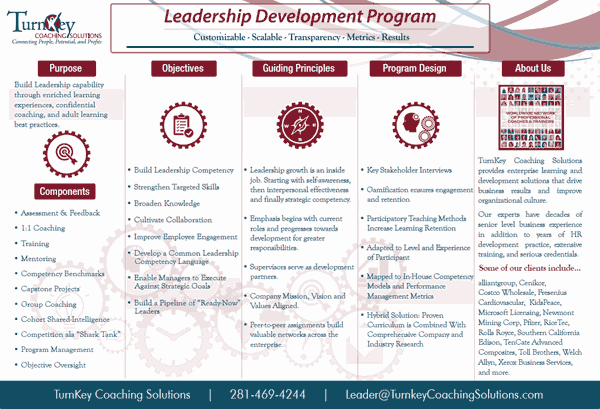 If it’s time your Leadership Training and Development Programs produced results – we can help. Our Leadership Training Program builds leadership capability through enriched learning experiences, confidential coaching, facilitated cohort interaction and adult learning best practices. Our consultative process enables clients to build their ideal program with a variety of options including assessments and feedback, 1:1 coaching, training, gamification, e-Learning modules, mentoring, competency benchmarks, capstone projects, group coaching, shared-intelligence, and investor panel presentations ending in a competition and celebration. We feel strongly that the most effective learning and development program take into account the organizational goals as well as the individual needs of each participant. This is why our programs are entirely customized to be a specific match to your organization’s mission, vision, values, level of leader/participant, and budget. In a hurry? Call us for a complimentary consultation – 281-469-4244 or Contact us here. First, what are your leadership training goals? Our leadership training program consultant will work to understand and design the program to meet your company’s objectives. What’s happening at your company? We will seek to understand your current culture, goals, challenges, and upcoming opportunities. Other initiatives? Recruiting initiatives? Organizational Surveys? Process Improvement implementations? Etc. Call us for a complimentary consultation – 281-469-4244 or Contact us here. We offer a comprehensive suite of leadership training & development programs in 200+ cities across America. Our professional, certified trainers facilitate keynotes, workshops and executive team retreats around a wide range of learning and development topics including conflict management, customer care, sales, leadership competency, team development, emotional intelligence, social intelligence, a coach approach to leadership, strategic planning, and 400+ other topics. 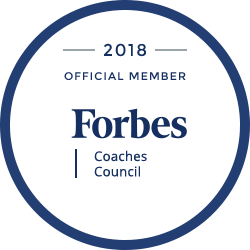 We have vast experience with sophisticated corporate coaching programs for all leadership levels, from frontline to high-potential to global executive teams. Our systems, procedures and processes were specifically designed to handle large-scale contracts, while still serving the unique needs of each participant. Our quality control processes ensure top-notch program management and professional coaching focused on business results and related leadership or strategic competency. Most enterprise providers offer “cookie-cutter” training services that fail to adapt to the industry, culture, goals, etc. That’s not what we do. For our cross-organizational or multi-channel initiatives, our lead trainer creates a “train the trainer” workshop with every engagement. Then, we work with our team of trainers to ensure a consistent, high-quality training for each site. We have a team of full-time, professional trainers across the United States. Your HR team has an opportunity to interview and select your trainers from our vetted, team of experts. Once selected, your trainers work together and thus will never be taxed by the number of participants, travel, logistics, etc. Additionally, our sophisticated systems for managing scalable programs, allow us to not only provide affordable solutions, but add a layer of objective oversight, quality control, transparency and ROI tracking, that simply put, is unmatched in the industry. We are proud of our hybrid solution in which we take our off-the shelf training modules and combine with company research, key stakeholder interviews, and relevant Strategic Alignment review to deliver a customized learning experience. We make sure that your workshops are relevant, engaging, memorable and an ideal match to your organizational objectives.